John, affectionately known by all as "Johnny," was raised in the Greek-American community in San Francisco, California. His family has always remained close to the folkways of their Greek villages and always had Greek dancing and music at their gatherings and celebrations on holidays, so it was as a young child that John learned the dances and songs of his family's area, Arkadia. His approach to teaching dances reflects his strong respect and feeling for the heritage behind them. John's great-uncle played the floyera (shepherd's flute) and, as a boy, John also began playing this and other Greek musical instruments, such as the daouli (large drum), baglamas (bagpipes), bouzouki (long-necked stringed instrument), gaida (short-necked stringed instrument played with a bow), karamoudza (a double-reed instrument, also called zourna), klarino (clarinet), lavauto (Greek lute), and santouri (a type of hammered dulcimer). 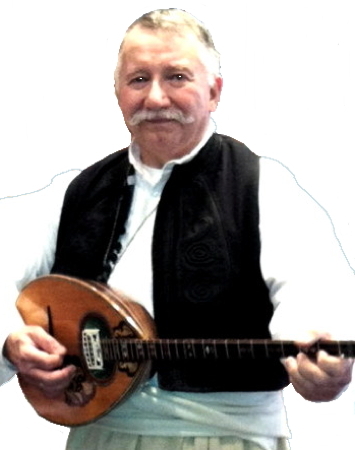 Since 1962, John has had his own Greek orchestra and hosts an award-winning website on Greek musical instruments, costumes, and dances. He has produced three CDs of Greek folk music. His band is located in Stockton, California, and includes Yiannis Pappayiorgas (John Pappas) and family members Paula, and Stathis. They perform with two other family members as T'Adelfia. In 1966, John went to Greece for three months. In 1970-71, he spent one year in Greece, living with relatives and traveling all over the Greek mainland. During this time, he studied dance, music, and costume. Teaching trips have taken John to all parts of the United States and Canada. He has taught at the University of the Pacific Folk Dance Camp (later named the Stockton Folk Dance Camp), Texas Camp, Mainewoods Dance Camp, University of California in Berkeley, Santa Barbara Folk Dance Conference, Stanford University, Pittsburgh Spring Festival, New York University at Cortland, Buffalo Gap in West Virginia, and many others. He also has taught in Hawaii, Grece, and Mexico. He has done choreographies and arranged the music for the suites of Greek dances for the Duquesne University Tamburitzans in Pittsburgh, Pennsylvania. John, who holds a Master's Degree in English Literature and several teaching credentials, and is now retired from teaching Greek dance, Greek Civilization, and English at San Joaquin Delta College in Stockton, California. He has been on the staff of the Order of the Arrow (Boy Scouts of America) working in Indian dance and culture and is currently doing Old Style Traditional dance, costume, etc. John and his wife Paula live in Stockton, California. Ethnic dances of Greece; Stockton, Calif.: J. Pappas, 1978.